When Rachel asked me to write a guest blog about my sister, I didn’t anticipate how difficult I would find it. First and foremost, she’s my little sister; close friend; childhood tomboy; the one who has the ability to make me lose control in a fit of the giggles, just by giving me a look. Of course she’s also Eilidh Doyle (née Child) – GB 400m hurdler; Scottish record holder, Commonwealth silver medallist, European champion. 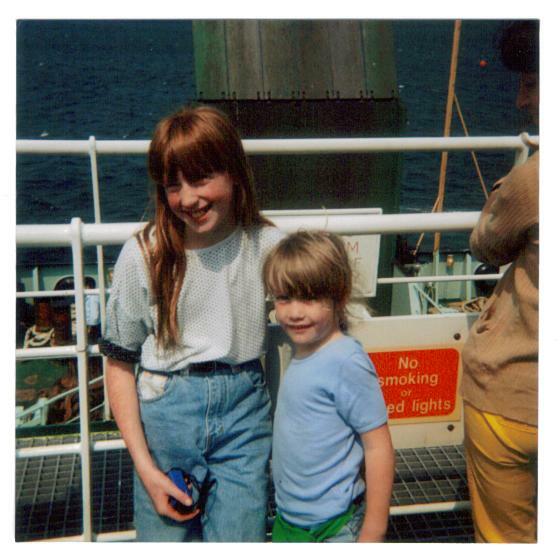 When you look at Eilidh now, you would never guess how unwell she was as a baby. Allergic to nappies, milk; not gaining weight; born with a spine problem with the possibility of her walk being affected - she gave my parents no end of worry when she was born. I always joke that if we’d been birds, she would have been the little runt of the litter that the rest of us ate to survive! It’s hard to believe that the skin-and-bones baby in photos is the same girl who now leaps the hurdles like a gazelle. We’ve always been a sporty family. I’m the eldest of four, with Eilidh being the youngest, and growing up we all played a variety of different sports. Swimming was my thing, which was why in my second novel, Swim Until You Can’t See Land, I wrote about a competitive swimmer. I’ve always loved swimming and it was a huge part of my life growing up. When I was younger some of my favourite books were the Alex quartet by Tessa Duder, all about a swimmer called Alex trying to get to the Olympics while coping with being a teenager at the same time. I’ve always wanted to write a swimming story but previous attempts ended up predictable and clichéd. With Swim Until You Can’t See Land, I turned the idea on its head and wrote an anti-swimming story – about a once competitive swimmer who has been forced to retire early through injury. I think in doing so I was able to get my love of the sport across in a much more powerful way, as Hannah realises how much she misses swimming and struggles to cope with life out of the pool. Eilidh also swam (and was very successful – winning the Scottish Schools 50m Butterfly two years in a row), but it was athletics that she loved. As a family, we’ve become so used to seeing her on the TV, hearing her on the radio, reading about her in the papers, that we’ve become quite blasé about it. But every so often, something will catch me off guard and I’ll find myself outside of the moment looking in – wow, that’s my little sister, that girl jumping over the hurdles, standing on the medal podium, appearing on A Question of Sport! 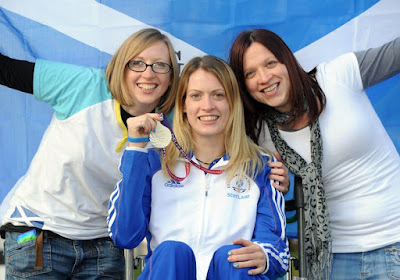 One of the most surreal moments I remember was after Eilidh won her Commonwealth silver medal in Delhi. That was her first major medal and my husband always says he wishes he’d set up a video camera to record us watching her final, the whole family screaming at the TV then collapsing into a heap afterwards. I remember being in a pub in Edinburgh the following day. A guy was leaning against the bar reading a newspaper and staring out from the back pages was a huge photo of Eilidh! I guess that was when the magnitude of what she’d achieved actually hit me. Of course, four years later, this was surpassed by her winning the silver medal in front of a home crowd in Glasgow. 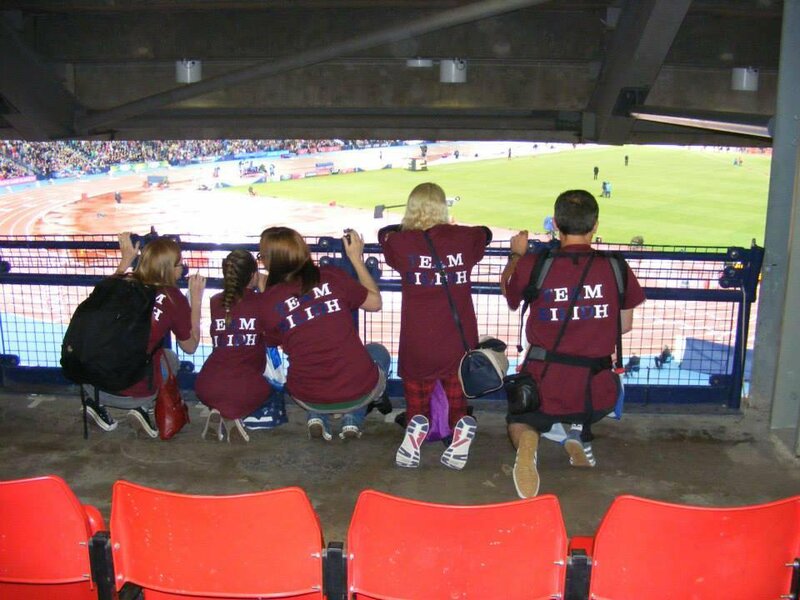 Being at Hampden was one of the most electric, most amazing, most nerve-wracking nights of my life. We were actually stopped on the way to the stadium by someone who wanted their photo taken with us as we were related to Eilidh (we were wearing our Team Eilidh t-shirts which gave us away!). We were so nervous that none of us could stay still and we all ended up pacing the stadium, before eventually watching her race from behind a railing! The lap of honour was brilliant to experience. To think that the whole stadium was up on their feet cheering for my little sister still makes me well up with pride and emotion. The worst part of her success is the fact that we don’t get to see her as much as we’d like to. She’s based down in Bath for her training and spends most of the summer competing all over the world. We all phone and Skype as much as possible though and the joy we get at seeing her do well makes up for it. She got married last year and being a bridesmaid at her wedding made me just as emotional and proud as seeing her race – maybe even more so. As I write this, Eilidh’s season has gotten underway again with the Olympic trials and then Rio itself still to happen in the next few weeks. I’m looking forward to it all with a mixture of excitement and anticipation - the nerves I feel watching her race are worse than anything I ever experienced when I competed myself and never seems to get any easier. Eilidh has the mental toughness to cope with it all though and never crumbles under pressure. I guess that part of her make-up is just as important as the part of her which makes her run fast – together they give her the strength to train and compete at the highest level and to always be striving to improve. The rest of us were all good at sport but we never had that extra something which makes the difference between a good athlete and a great one. Maybe because she was the youngest she was always trying to keep up with the rest of us? She always had bundles of energy when she was growing up, she would never sit still - even when she slept her arms and legs would be twitching and wind-milling – maybe she’s able to channel that energy onto the track now? It goes without saying that we’re all incredibly proud of her – she doesn’t need to break records or win medals to achieve that either. We’re a very close family and incredibly supportive of each other, and look out for each other in everything we do. It works both ways too, when I was having my daughter, I was desperately trying to find out how Eilidh had got on in a race she was competing in, while she was straight on the phone after running to try and discover if she was an aunty yet! Success hasn’t changed her either, she’s still the same personable and down-to-earth girl she always has been. So yes, she’s Eilidh Doyle the athlete and I’m hugely proud of her for that and hoping for more success in the future, but more importantly she’s my little sister and I’m even prouder of her for being that! Thank you so much Catriona for this wonderful post about your immensely talented sister. 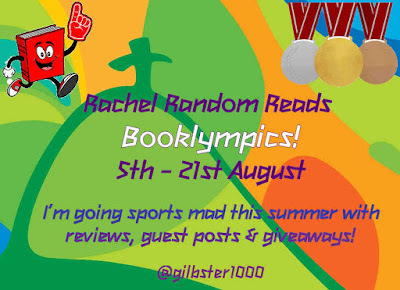 Since this was written, I am delighted to say that Eilidh has made the squad for Team GB and the first round of the 400m Women's hurdles is in the evening session on Monday 15th August. I know I will be watching if at all possible and hope you will all watch and support her too. Described by the Edinburgh Evening News as ‘one of the brightest prospects among a thriving breed of fresh Scottish writing talent,’ Catriona Child is a Scottish writer based in Edinburgh. She has a degree in English from the University of Aberdeen and an MA with distinction in Creative Writing from Lancaster University. 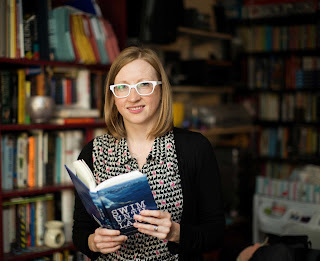 She won the Sunday Herald Blog competition in 2007, was shortlisted for the National Library of Scotland/The Scotsman Crime short story competition in 2008, and has been published in the Scottish Book Trust Scottish Family Legends anthology and in Northwords Now. Her first novel, Trackman (Luath Press), was published in 2012 and was described by The Herald as having ‘all the makings of a cult hit’. Her second novel, Swim Until You Can’t See Land (Luath Press), was published in 2014 and charts the relationship between two women born sixty years apart – professional swimmer Hannah Wright and Marièle Downie, a wartime spy in occupied France. 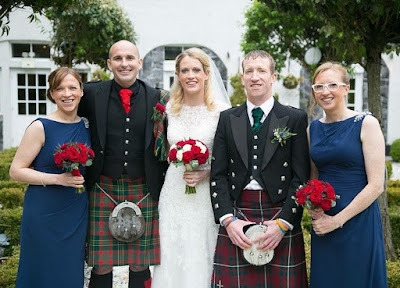 Catriona lives in Edinburgh with her husband Allan and daughter Corrie. 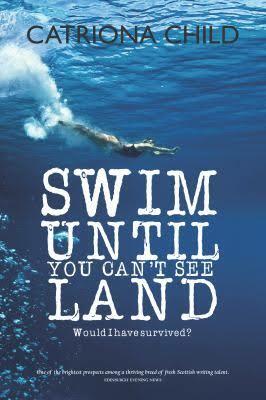 Catriona Child has donated a copy of Swim Until You Can't See Land to one lucky winner as part of the Booklympics. Giveaway open to UK only, all options are voluntary, but please do what they ask, as I will be verifying the winner. Giveaway closes 23:59 16/8/2016. Winner will be announced on twitter and emailed, and they will need to reply within 7 days, or forfeit the prize, and I will re-draw for a new winner. Good luck everyone.